Spruce Up Your Feasterville Trevose Home With a Little Carpentry! 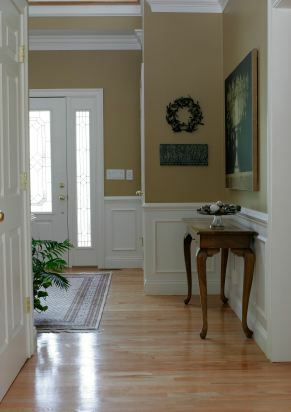 Have you been wanting to add crown moldings to your Feasterville Trevose, Pennsylvania home? They are relatively inexpensive, and moldings will add a touch of elegance to interior rooms. Henderson Custom Painting painters are skilled in providing light carpentry services, including installing many styles of trim and moldings to create elegant accents to your interior rooms. Add class to your dining room with moldings or chair rails. Installation of wainscoting in kitchens, restrooms and other areas is also a popular carpentry service in Feasterville Trevose. Henderson Custom Painting carefully prepares all interior surfaces for trim by sanding, priming and painting as required. Let Henderson Custom Painting freshen up your Feasterville Trevose home with light carpentry accents. The trusted painters of Feasterville Trevose can make your home even more spectacular with light carpentry services! Are you tired of looking at dented baseboards and door jams? Is the paint peeling or chipped? Sometimes a fresh coat of paint is enough to freshen up a room. When it isn't, Henderson Custom Painting can remove the old trim and replace it with new wood trim. Call Henderson Custom Painting today for a free estimate. We can help you choose the most cost effective way to update your Feasterville Trevose PA home with carpentry touches. We also frequently install and paint or stain interior and exterior doors. Call the dependable Feasterville Trevose carpenters at Henderson Custom Painting to update your home and give it more modern look and feel. Our Feasterville Trevose light carpentry professionals are skilled in many woodworking projects. Call today for a free in-home consultation. We will happily help you choose trim and doors as well as colors and textures.